Automatic vs Portable Generators: Which Is Better? Generator use is on the rise throughout Massachusetts as the area has seen an increasing amount of severe storms over the past few years. Our state’s electrical infrastructure — while it does function — is oftentimes faulty and outdated. Major utility companies are making an effort to repair and replace older electrical lines, but it may be best to invest in a generator instead of relying on the power grid in the event of a power outage. But which type of generator is the best option for homeowners in Massachusetts? At Morrill Electric, we believe that homeowners should look into purchasing an automatic backup generator as opposed to a portable generator. An automatic backup generator acts as a separate electrical system for your entire home if the power goes out. Backup generators all work to provide homeowners with much needed electricity, but automatic generators do not need to be manually switched on. Within just seconds of a power outage, the automatic backup generator will kick on and restore power to your home, including your heating system, electrical outlets and household appliances that require electricity. There’s no need to turn the generator off once the power has been restored either as it will shut itself off once utility power returns. The automatic backup generator — which is permanently installed next to your home much like a central AC unit — runs on natural gas or propane. Aside from being recommended by the American Red Cross, there are a number of additional benefits to choose an automatic generator over a portable one. Having an automatic backup generator properly installed outside your home eliminates the issue of carbon monoxide poisoning. Portable generators need to be brought into the home and can end up causing carbon monoxide poisoning. If these portable generators aren’t brought into the home, then they will need to be placed outside with an electrical wire running through an open window (which can cause your home to remain cold during a winter storm). Automatic generators run on natural gas by hooking up to your home’s gas line. Portable generators, on the other hand, require the purchase of often expensive gasoline which can be difficult to refill if road conditions have deteriorated. Tapping into the natural gas line is much less expensive and much more safe. 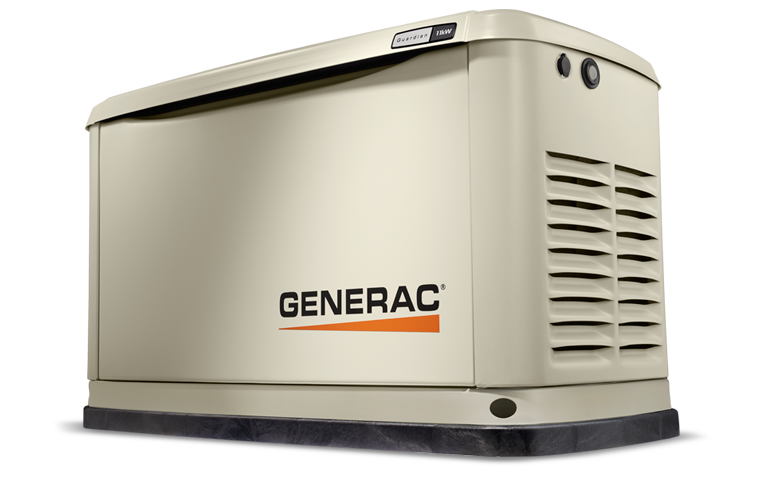 In the event of a power outage, automatic generators restore power within seconds. With portable generators, homeowners will need to grab a flashlight, rummage through the garage or basement, haul out the generator, fill it with gasoline, run an extension code through the home, and start the generator manually. The whole process could take an hour or more. With automatic generators, there is no need to worry if the power goes out and you’re not home. These generators are safe since they tap into the natural gas lines and they turn themselves off when power is restored. Portable generators, on the other hand, will need to be monitored closely so that they do not run out of gasoline and they need to be manually switched off when power is back up and running. Losing power is frustrating and unexpected, so why not keep your home and your family safe by opting for an automatic generator? Morrill Electric will help you choose the best type of automatic generator for your home so ensure that your family is comfortable and prepared for anything. Contact us today for a free estimate!